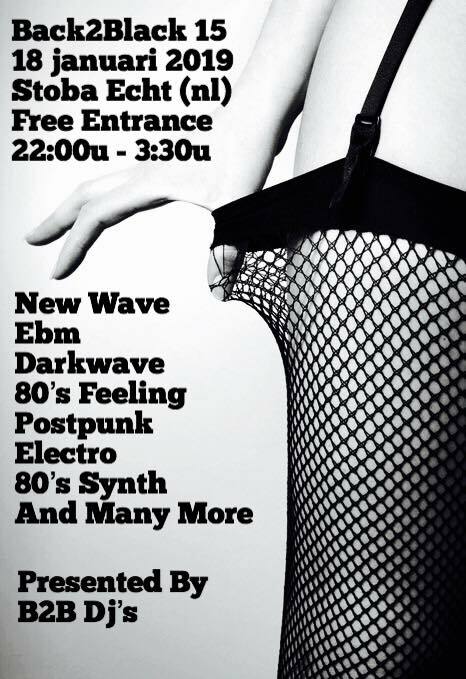 Back 2 Black – Stoba – Echt – Nederland – The dark 80’s at it’s best! Back in the 80’s I spent a LOT of time in Limburg, mostly in Heerlen, but we would often go to The Stoba in Echt.. and the one thing i can remember from back in the day, I / we ALWAYS had a great time there!.. 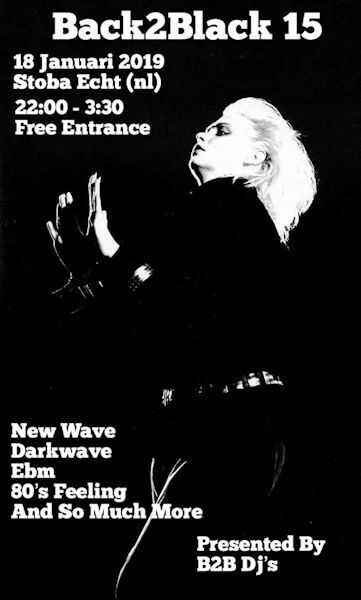 Back then i always thought of the Stoba as being the equivalent of “Femina” in Heerlen, the DJ’s tried to please numerous walks of life, and as a New Waver / Goth, I definitely got my fill..
That saying, The Stoba also hosted some great New Wave bands. The first time I saw The Clan of Xymox was at the Stoba..
All in all the Stoba was a fantastic place to be for New Wavers / Goths back in the 80’s..
New Wave nights, 80’s nights etc became a big thing again, focusing mainly on the age group 40+ . People that knew how to party and have a good time.. the people that were actually part of the 80’s.. Yet again I traveled all around The Netherlands visiting these venues, quite often in the same club as they were when I was a teenager back in the day..
Then in 2017 we went to the Back2Black at the Stoba in Echt.. I was very excited, ‘cos it was one of my old 80’s haunts. We had a complete blast!.. I remember so vividly walking through the bar, gravitating towards the door that takes you into the venue / dance floor, Bauhaus getting louder and louder.. I was completely transformed back to the 80’s club scene. I could actually even smell the 80’s.. The people were amazing, and the music was just fantastic!.. The DJ’s that spin at the Back2Black were obviously a big part of the original 80’s New Wave / Goth / Punk scene, and KNEW what was played back in the day.. I heard songs being played that I had completely forgotten about, and had not heard for 35 years! All in all, the Back2Black is honestly in a league of it’s own when it comes to organizing 80’s New Wave / Goth venues..
What I LOVE about the Back2Black in a nutshell..
First of all, definitely the Music, the DJ’s KNOW what was played back in the 80’s, and they definitely get you forgetting that we are living in 2018.. The people are amazing and friendly. The majority of them were actual New Wavers back in the 80’s, but saying that, the younger ones are TRUE to keeping the 80’s New Wave scene alive today.. So, for anyone wanting to relive their days in Black, then do yourself a favor and join like minded people at the Back2Black parties..